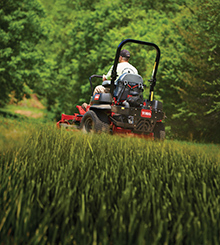 The redesigned MyRIDE™ suspension system is available on select Toro® Z Master® zero-turn mowers. Built for maximum comfort, the MyRIDE suspension system features a suspended operator platform with adjustable rear shocks that isolates the operator from the rest of the machine. This design reduces impacts, bumps and vibrations for a superior ride experience and increased productivity.